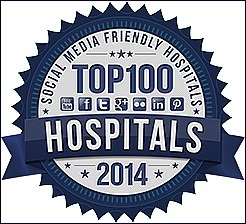 and are honored that NurseJournal.org has named Mayo Clinic as #1 on its 2014 list of the top 100 most social media friendly hospitals. How did we zoom to the top? NurseJournal staffers collected data about Twitter and Facebook use by 800 hospitals. In reviewing the list, we're also delighted to see members of the Social Media Health Network are among the other 99 hospitals mentioned. Mayo Clinic, through its Center for Social Media and Social Media Health Network, is committed to helping peers in health care learn to engage effectively through social media. Thanks, NurseJournal.org, we appreciate having our mission and vision acknowledged and affirmed. Learn and grow along with us! for special bundles and rates. Learn and grow along with us! Register now for Social Media Week at Mayo Clinic October 20-23, 2014 in Rochester, Minnesota Learn more and register with this link for special bundles and rates.